Zinc is one of a few metals that were widely used by human societies in alloys long before they were recognized as metals themselves. The earliest brasses, alloys of copper and small percentages of zinc, first produced as early as several millennia BCE, likely resulted from the accidental smelting of zinc-rich copper ores. There is evidence that by the eighth century BCE, the special properties of metals smelted from such ores was recognized, and thus the ore was highly valued and sought after. Later, starting in the first century BCE, brass was produced by heating copper ore and zinc ore together, producing a zinc vapor that reacted with the copper. At this time, brass became widely used in coinage and military equipment, and the methods for producing it spread around the world. By the 14th century in India and 17th century in China, the metallic form of zinc was finally produced deliberately, and a variety of European chemists and alchemists worked with the metal, but discovery of zinc as an element is generally credited to German chemist Andreas Marggraf for his extensive work in 1746, which documented his ability to obtain metallic zinc from a number of zinc compounds. In modern times, zinc continues to be used as an alloy metal. Brass alloys are more corrosion resistant than copper and more workable than zinc alone or the other common copper alloy, bronze. They are additionally notable for their acoustic properties, which lend them to use in musical instruments. Brass also retains some of the antimicrobial properties of copper, and therefore is used for commonly touched objects in hospitals, including doorknobs and surfaces. Another alloy, "nickel silver," contains nickel, copper, and zinc, and is used decoratively and for many musical instruments that are silver in color. There are also many majority-zinc alloys tailored to specific uses, with small amounts of additives used to impart key qualities. Zinc-aluminum, for example, has a lower melting point and lower viscosity than zinc, making it more suitable for casting of small and intricate shapes. Zinc sheet metals are produced using small amounts of titanium and copper, which make a resulting alloy less brittle than zinc that therefore can be roll formed or bent. As important as zinc alloys have been throughout history and still are today, in modern times zinc’s largest use is in galvanizing other metals, usually iron or steel, to protect them against corrosion. Galvanization is simply the application of a thin coating of zinc to a metal surface through any of several methods. Initially, the top of this layer reacts with the atmosphere to produce zinc carbonate, which protects all the underlying metal from corrosion. When the zinc layer is scratched down to the underlying metal, however, zinc still protects the underlying metal, now by acting as a sacrificial anode. This same property is exploited when zinc is used as the sacrificial anode in cathodic protection of buried pipelines or submerged iron components of a ship. Zinc also serves as an anode in alkaline batteries, zinc-carbon batteries, silver-zinc batteries, and zinc-air fuel cells, and as a cathode in silver oxide batteries. Dozens of zinc compounds find use in everyday products such as deodorants, cosmetics, sunscreens, anti-dandruff shampoos, and dietary supplements. Some zinc compounds find use in organic synthesis or industrial chemistry: notably, zinc oxide has long been used as a catalyst in the vulcanization of rubber. Additionally, compounds of zinc with oxygen, sulfur, selenium, or tellurium are all II-VI semiconductors with properties that recommend them for a variety of optoelectronic applications, including light-emitting diodes (LEDs), laser diodes, and solar cells. Zinc sulfide, zinc selenide, and zinc telluride all are used as infrared or near-infrared optical materials, and doped versions of each compound exist with other useful properties such as scintillation. Zinc may also serve as a component the ternary semiconductors cadmium zinc telluride and mercury zinc telluride, which are useful for similar applications, but additionally have band gaps that can be easily tuned by altering the precise composition of the material. Zinc is the fourth most commonly used metal, behind only iron, aluminum, and copper. It is mined primarily from zinc sulfide deposits, which are generally roasted to produce zinc oxide and then processed to the metal through pyrometallurgy or electrowinning. Most of the zinc used annually is newly mined, but about thirty percent is recycled. Zinc has unusual electrical, thermal, optical, and solid-state properties that have not been fully investigated. Zinc metal is employed to form numerous alloys with other metals. Brass, nickel silver, commercial bronze, soft solder, and aluminum solder are some of the more important zinc alloys. Zinc is used to produce die castings which are used extensively by the automotive, electrical, and hardware industries. Zinc is also used to galvanize other metals such as iron to prevent corrosion. Zinc oxide is widely used in the manufacture of paints, rubber products, cosmetics, pharmaceuticals, floor coverings, plastics, printing inks, soap, storage batteries, textiles, and electrical equipment. Zinc sulfide is used in making luminous dials, X-ray and TV screens, and fluorescent lights. The chloride and chromate are also important compounds. Zinc is available as metal and compounds with purities from 99% to 99.999% (ACS grade to ultra-high purity). Elemental or metallic forms include pellets, rod, wire and granules for evaporation source material purposes. Zinc nanoparticles and nanopowders provide ultra-high surface area. Zinc oxide is available in powder and dense pellet form for such uses as optical coating and thin film applications. Oxides tend to be insoluble. Fluorides are another insoluble form for uses in which oxygen is undesirable such as metallurgy, chemical and physical vapor deposition and in some optical coating. Zinc is also available in soluble forms including chlorides, nitrates and acetates. These compounds can be manufactured as solutions at specified stoichiometries. Zinc is a Block D, Group 12, Period 4 element. The number of electrons in each of zinc's shells is 2, 8, 18, 2, and its electron configuration is [Ar] 3d10 4s2. The zinc atom has a radius of 133.5.pm and its Van der Waals radius is 139.pm. In its elemental form, CAS 7440-66-6, zinc has a silver-gray appearance. It is brittle at ordinary temperatures but malleable at 100 °C to 150 °C. It is a fair conductor of electricity, and burns in air at high red producing white clouds of the oxide. Zinc is mined from sulfidic ore deposits. The most common zinc ore is sphalerite (zinc blende), a zinc sulfide mineral. It is is the 24th most abundant element in the earth's crust and the fourth most common metal in use (after iron, aluminum, and copper). Metallic zinc was first isolated from a variety of zinc compounds by Andreas Marggraf in 1746. The element name zinc originates from the German word "zin" meaning tin. Zinc is considered non-toxic in moderate doses but can cause nausea if taken in excess. Safety data for Zinc and its compounds can vary widely depending on the form. For potential hazard information, toxicity, and road, sea and air transportation limitations, such as DOT Hazard Class, DOT Number, EU Number, NFPA Health rating and RTECS Class, please see the specific material or compound referenced in the Products tab. The below information applies to elemental (metallic) Zinc. 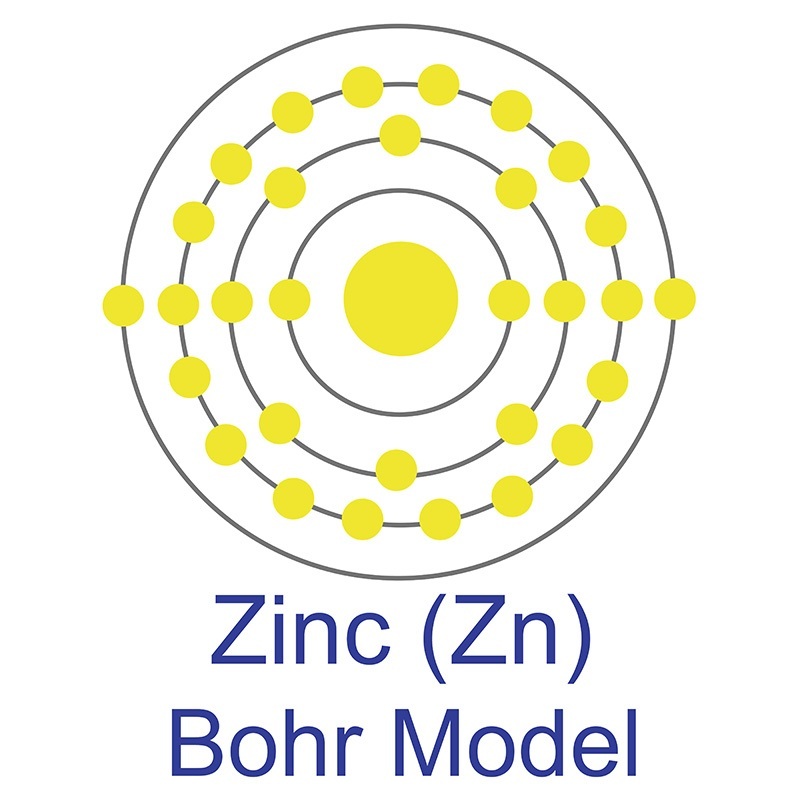 Zinc has 5 stable isotopes: 64Zn, 66Zn, 67Zn, 68Zn, and 70Zn.